OAKLAND, Calif., May 31 /CSRwire/ - The VERGE 18 conference and expo returns to the Bay Area this October as the leading platform for accelerating the clean economy, attracting an A-list of allied organizations that will be holding their own events concurrently. In partnership with these diverse leadership organizations, VERGE 18 will convene an influential audience of more than 2,500 leaders — from companies and utilities, city and regional governments, policy makers, NGOs, solution providers and startups — seeking to build an equitable, inclusive economy that increases economic and community resilience. Since 2012, VERGE has broken down silos and convened leaders from across industries and sectors to explore scalable, cross-cutting solutions at the intersection of technology and sustainability. This year, VERGE will take a deep-dive into the most dynamic and influential markets, through three concurrent conferences — VERGE Circular, VERGE Energy and VERGE Transport. Cleantech Open will host the Western Region Awards & Innovation Showcase on the final day of VERGE, October 18. The capstone event of Cleantech Open’s annual accelerator program in the West serves as an opportunity to highlight and celebrate the progress of more than 45 participating startups, and to connect them with the partners who will support them on their path to market — investors, corporate partners and other participants in the cleantech commercialization support ecosystem. The CE100 Acceleration Workshop, organized by the Ellen MacArthur Foundation, will take place immediately before VERGE 18, on October 15-16, and bring together corporations, governments and cities, academic institutions, emerging innovators and affiliates, and other selected organizations committed to transitioning to a circular economy. 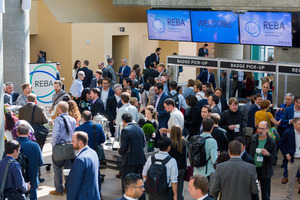 The REBA Summit, also taking place immediately before VERGE 18 on October 14-16, will accelerate the fast-growing market for renewable energy transactions — bringing together more than 400 renewable energy buyers and solution providers to develop new partnerships and collaboratively tackle barriers and opportunities to continue growing the market. REBA is a coalition of leadership organizations with deep expertise in transforming energy markets and works with large renewable energy buyers, including corporations, universities, cities, hospitals and local agencies. The coalition is made up of BSR’s Future of Internet Power, Rocky Mountain Institute’s Business Renewables Center, World Resources Institute’s Electricity Initiative and World Wildlife Fund’s Renewable Energy Buyers’ Principles (also supported by World Resources Institute). To learn more about VERGE 18, click here [https://goo.gl/y74s83].